JULY 2-8, 2014 UCW 3 WWW.UPANDCOMINGWEEKLY.COM V.I.P Early Bird Edition delivered "Free" directly to your computer every week. Sign up today! WWW.UPANDCOMINGWEEKLY.COM This Week In Fayetteville WEDNESDAY, JULY 2 FAYETTEVILLE FARMERS MARKET at 325 Franklin St. 2-6 p.m. Visit www.fayncfarmersmarket.com for more information. THURSDAY, JULY 3 SWAMPDOGS at J.P. Riddle Stadium. Visit http://goswampdogs. com/ for information. INAUGURAL FREEDOM RUN at the Medical Arts Building in Downtown Fayetteville, 7 p.m. For information, visit the website at http://www. cincodemayo10k.org/Freedom_Run. php or call (910) 578-9680. FRIDAY, JULY 4 FIRECRACKER 4 MILER at the N.C. Veterans Park at 7 a.m. The 4-mile course winds through downtown Fayetteville. For more information, visit www.facebook. com/FireCrackerFourMiler/info or call (910) 433-1547. 4TH OF JULY CELEBRATION AT FORT BRAGG featuring Josh Turner and .38 Special, finishing with a world-class fireworks display. Event begins at 3 p.m. For more information, visit www. facebook.com/pages/Fort-Bragg- Family-and-MWR/101037824325 or call (910) 396-9126. 4TH OF JULY FESTIVAL ON MAIN STREET in Spring Lake begins at SATURDAY, JULY 5 FAYETTEVILLE FARMERS MARKET at 325 Franklin St. 8 a.m. - 1 p.m. Visit www.fayncfarmersmarket.com for more information. SWAMPDOGS at J.P. Riddle Stadium. Visit http://goswampdogs. com/ for information. 46TH ANNUAL LUMBEE HOMECOMING Pembroke, 636 Prospect Road. Outdoor market, car show, 10 a.m. parade, 6 p.m. gospel concert, 9 p.m. fireworks. Call 910- 521-8602 for more information.. noon and features live entertainment, kid's zone, water activities, car show, food and craft vendors. 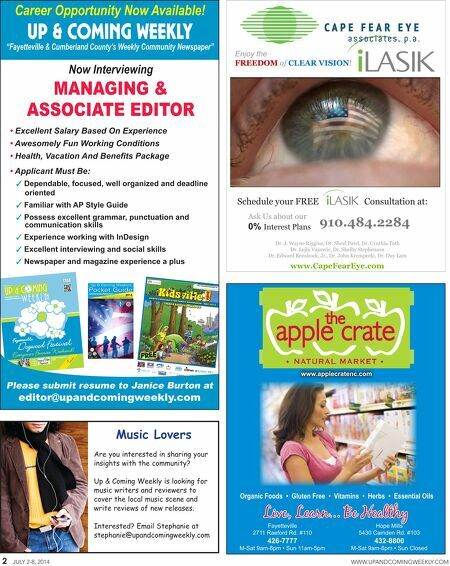 For more information, call (910) 497-8821. HOPE MILLS 4TH OF JULY PARADE AND CELEBRATION sponsored by the Hope Mills Chamber. The parade begins at 10 a.m. The celebration begins at noon and features bands performing throughout the day, children's activities, food vendors, arts and crafts and inflatables. The fireworks begin at 9:15 p.m. For more information, visit www. hopemillschamber.org/index.php/ component/k2/item/14-town-of-hope- mills-4th-of-july-parade or call (910) 423-4314. Call BMFCU for more information at 910-222-1500 or go to www.BraggMutualFCU.com 2917 Village Drive • Fayetteville, NC • 910-488-3515 219 N. Main Street • Spring Lake, NC • 910-436-1894 201 Hay St., Ste. 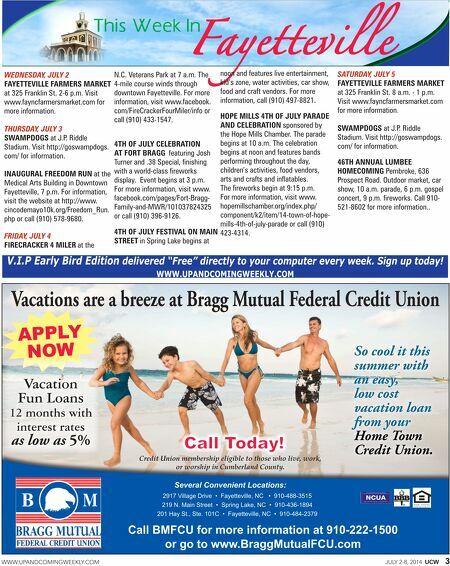 101C • Fayetteville, NC • 910-484-2379 Several Convenient Locations: Vacations are a breeze at Bragg Mutual Federal Credit Union APPLY NOW Vacation Fun Loans 12 months with interest rates as low as 5% So cool it this summer with an easy, low cost vacation loan from your Home Town Credit Union. Call Today! Credit Union membership eligible to those who live, work, or worship in Cumberland County.